Preserve you gate and fencing! SuperPosts come in two different sizes made to fit standard 4x4 or 5x5 wood fence posts. The vinyl sleeve is available in 18” 24” or 36” lengths. Sealer caps are offered in white or brown. This post protection system is pre-assembled with a bottom cap glued to the vinyl (PVC) sleeve, a rubber gasket, two stainless steel screws, and a two piece sealer cap. 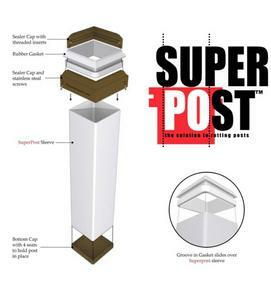 SuperPosts are sold individually or in boxes of three. Discounts are available for bulk orders. 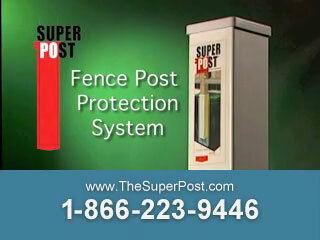 The SuperPost is available throughout the U.S. and Canada. 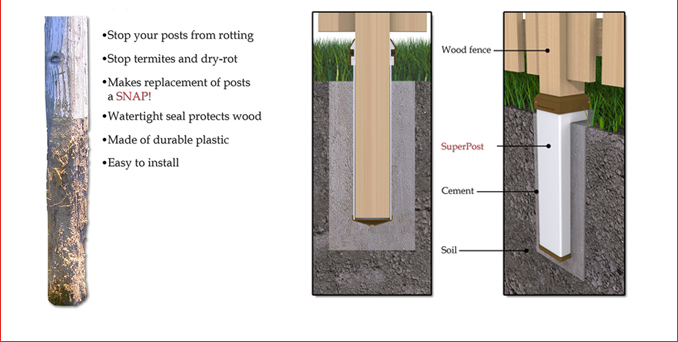 Weed wacker, string line trimmer, weed eater, whatever you call it, The SuperPost protects your wood post from this everyday garden tool. The vinyl sleeve and molded sealer cap are placed in the ground, protecting the post right where the damage occurs!